The 25SATSAS35 2.5-inch SATA/SAS to 3.5-inch SATA Hard Drive Converter converts a 2.5-inch SATA or SAS hard drive (HDD) or solid state drive (SSD) into a 3.5-inch form factor SATA Hard Drive. 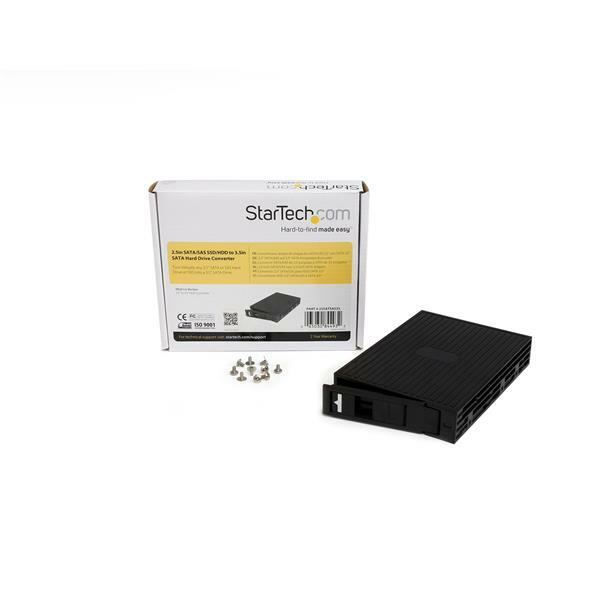 The converter provides a versatile solution for 2.5-inch drive installations, enabling you to install a 2.5-inch SATA/SAS drive in a 3.5-inch bay, drive drawer caddy/tray, or into a 3.5-inch drive enclosure. Suitable for drives with a height of up to 15mm, virtually any 2.5-inch SATA or SAS hard drive can be made to look and function like a 3.5-inch hard drive. The drive converter includes mounting holes along the side and base, allowing you to mount the drive if needed, into a compatible system. 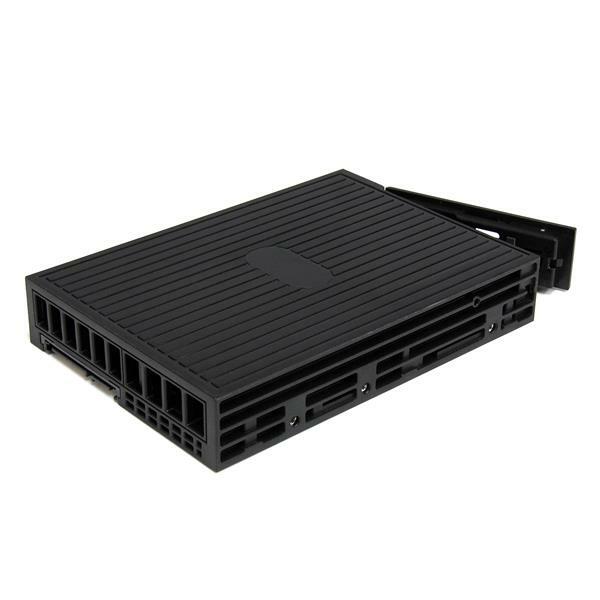 The Drive Converter features a trayless design for simple drive installation and removal, and is constructed of durable, yet lightweight plastics, with ventilation openings to aid air flow and help keep hard drives running cooler. Note Although mobile racks can enable a Serial Attached SCSI (SAS) drive to connect using a standard Serial ATA (SATA) connector, the hard drive controller must be SAS compatible to properly support SAS drives. SAS controllers can work with SAS and SATA drives, but most SAS drives will only work with a SAS controller. 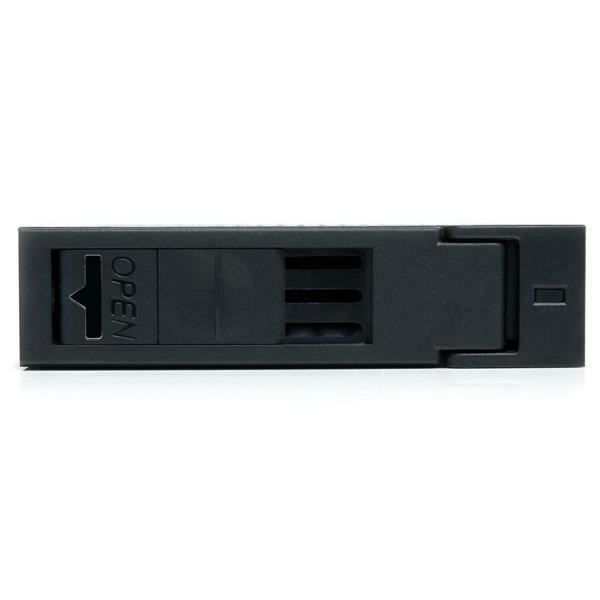 Can I convert a SAS drive to SATA with this mobile rack? Although mobile racks can enable a Serial Attached SCSI (SAS) drive to connect using a standard Serial ATA (SATA) connector, the hard drive controller must be SAS compatible to properly support SAS drives. SAS controllers can work with SAS and SATA drives, but most SAS drives will only work with a SAS controller. For further information about SAS and SATA interoperability, refer to the following FAQ: http://www.startech.com/faq/hard_drive_controllers_sas_drive_compatibility. First: could not just slide in the 2.5 drive into the converter, (about 1/2 an inch stuck out the back) in the end I just removed the 8 or 9 screws placed the drive and reassembled the converter. Second: the mounting holes did match the pins on my Dell’s mount. This is a decent product. I used it to put a 2.5 SSD in my tower workstation. It fit and worked well. (3 stars) Solid performance, not so solid build. OK, so I tried to use it internally, but the mount holes don't line up at all (can't move it forward or back in the Lenovo or CoolerMaster case internal positions I tried since they use plastic spacers that fit into the drive holes, which of course, don't line up. My son's PC is built inside an older case that has a 3.5" floppy slot. This chassis works fine in that slot. It was then that I noticed that the drive holes are spaced just fine for a 3.5" HDD, but slid backwards---aka, if the end of the drive was flush with the case--and why would anyone want their internal drive sticking OUT? OK, that being said... I popped an SSD in, and then slid the chassis into a Startech trayless 3.5" removable that I have mounted on the front of my tower, so a drive in a drive tray, in a drive tray. Fit just fine (screw holes are irrelevant this way), and works like a drive should, no performance impact on the SSD within, and invisible to the OS since it's just passing SATA through. As for the build... I like the "open" button and the sliding lock. The plastic is fine for something that doesn't get swapped too often, but doesn't feel that solid. Older trayless drive slots that I use (all Startech BTW...) are solid, and have some metal in the door/latch/housing to provide extra strength/durability. I just don't se that with this adapter. I would buy this to use SSDs in my tower, as removables. But would not recommend if it is going to be in a work environment with people that are hard on the hardware. So perfect score on actual performance, but not so much on physical build. I received this product in exchange for an unbiased review. Thank you for sharing your review of our 25SATSAS35. We do have a variety of similar adapter options for different applications, and perhaps a different version like our 25SAT35HDD would be better suited. This drive converter comes with a 2 year warranty and lifetime technical support. If you do ever run into issues with us, please reach out by clicking Support in the grey bar at the top of our website. We have Technical Support Advisors available 24 hours, 5 days a week. The hard drive adaptor has been working well for me but physically very cheap and with limited mounting options, could be better. The hard drive adaptor comes in a box just barely bigger than 3.5 inch hard drive. 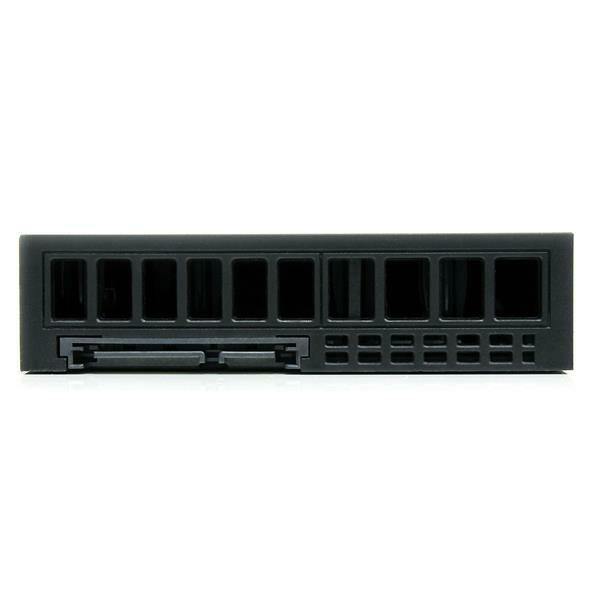 It is made of all black plastic and raddles like there are loose parts inside when either empty or with a drive installed. When you put a drive in it, the case makes a very scary 'crack' sound. I still can't get used to the terrible sound of the door closing as it sounds like I just broke the hard drive. The open latch is clearly labeled, but at a glance the sliding lock also looks like a latch and breaks off very easy if you try and pull it. There is a blue LED light on the front that lights when it has power. The light doesn't change or flash for drive activity. The adaptor is the same size as a regular 3.5" hard drive however the screw holes are NOT in the same position so the adaptor cannot be installed where other hard drives can. Screws are included with the adaptor. The adaptor works well once the drive is in. The adapter works in SATA docking stations and connected directly to my motherboard. The hard drive adapter works as needed, but is very cheaply made with it raddling and cracking sounds and can't be mounted where 3.5" drive can be. I received this product in exchange for an unbiased review. Thank you for sharing your review of our 25SATSAS35. We wouldn't expect there to be loose parts or a rattling sound from the 25SATSAS35, and would like to look into this further with you. This drive converter comes with a 2 year warranty and lifetime technical support. Please reach out to us by clicking Support in the grey bar at the top of our website. We have Technical Support Advisors available 24 hours, 5 days a week. I had a spare 2.5 inch hard drive and an open 3.5 inch bay in my desktop. This drive enclosure let me put my 2.5 inch drive into the enclosure and mount it into my desktop as additional storage. The case does feel a bit thin and cheap and the lock fell off the first time I used it. I had no issues with the lock after I put it back on. Must of came loose during shipping. It also comes with mounting screws. All in all, the drive was installed into my desktop with no issues at all. This is a good quality adapter to take 2.5 drives to 3.5. I don't think the design is bad at all but the build of the unit feels cheap compared to some of the other adapters I have had. The performance of the adapter is great and can not be faulted at all. It installed perfectly into my tower and caused zero issues. Overall the product works well. "I received this product in exchange for an unbiased review"
We purchased 10 of these only to find out that the side mounting holes do not line up with the side mount holes on a standard 3.5" HDD. This is turn made them useless for upgrading our HP AIO because the HDD caddy is made to line up with a standard HDD mounting points. Also, the threading for said points are fine... as opposed to all standard HDD having coarse threads.